Instant Pot Chicken Tortilla Soup is a fast, delicious, and easy way to get all the flavors of a chicken tortilla in a soup. This dish only takes minutes to prepare but tastes like it has been cooking all day. 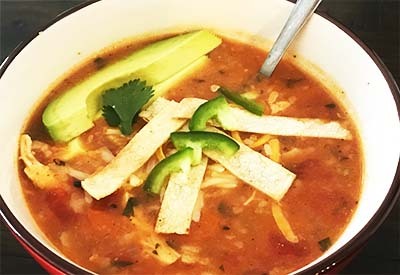 Thick and hearty bowl of Instant Pot chicken tortilla soup. Served with strips of toasted tortillas, jalapenos and avocado slices. One of the biggest benefits of owning an electric pressure cooker, such as my beloved Instant Pot 6 quart duo, is that the food tastes like it has been cooking all day! 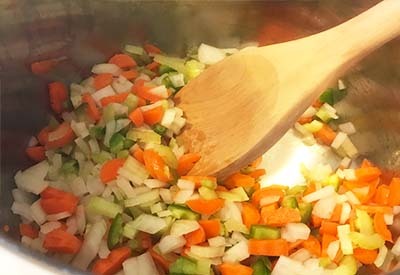 Soups in particular are super easy and cook in minutes as compared to hours to obtain the same depth of flavor when cooking on the stove top or in a slow cooker. Saute your vegetables until slightly tender. This pot can do it all! First of all you can saute your vegetables directly in the bottom of the pressure cooker. Push the saute button until it reads hot, heat your oil and your veggies will be cooking in no time! Then turn off the Instant Pot, dump in the remaining ingredients and cook on high pressure for 7 minutes. While the pot is coming up to pressure prior to cooking, feel free to clean up the dishes, take a quick shower, or even sit down with a pre-dinner drink! 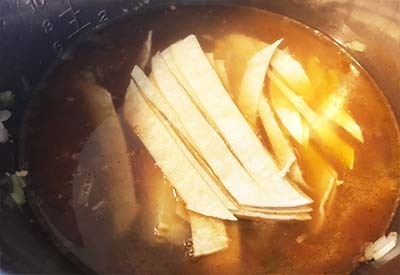 Slice small corn tortillas into strips and place them in the soup. For this recipe you could also use that extra free time to toast strips of a tortilla to use as an extra garnish if you feel motivated to do so! Make it easy on yourself and use a rolling pizza cutter to cut several tortillas stacked together to make the strips. Place the cut strips on a parchment lined baking sheet, spray with a little oil and bake for 8-10 minutes at 350 degrees F. It’s that easy! This Instant Pot Chicken Tortilla soup recipe is the perfect meal for a cool day when you just need a little warmth in your life. Don’t be afraid to add a few extra spices or some diced jalapenos in if you like it hot! You could even throw in a cup of frozen corn or black beans if you want to make it extra thick and hearty. The possibilities are endless! 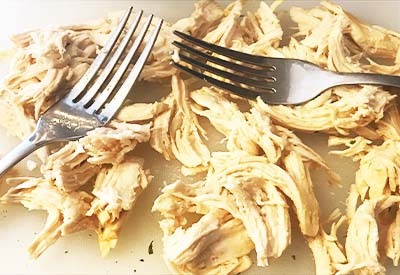 Shred the chicken breast with two forks and return to the pot before serving. This recipe has become one of our favorite weeknight meals. Everyone loves it and it there is usually enough leftover for a quick lunch the next day. If you like this recipe, be sure to check out our Instant Pot Chicken Fajitas Recipe which includes the secret to making it with crisp peppers and onions! 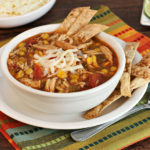 All the delicious flavors of a chicken tortilla in a thick and hearty soup. Serve with crispy tortilla strips, avocados, sour cream and/or cheese for a full and satisfying meal. Press the sauté button on the instant pot until it reads HOT. Add the olive oil, onion, celery, carrots and jalapeno. Sauté for 3-4 minutes until the vegetables start to soften. Stir in the garlic, spices and salt and sauté for an additional minute. Cancel sauté mode. Add the chicken stock, tomatoes, tortilla strips and chicken. Close the instant pot, seal and pressure cook/manual on high pressure for 7 minutes. When the time is up allow natural pressure release for 10 minutes. Then quick release any remaining pressure. Remove the chicken breast and shred with a fork, and then add it back to the soup. Stir in the cilantro and lime juice.